Welcome to my home! 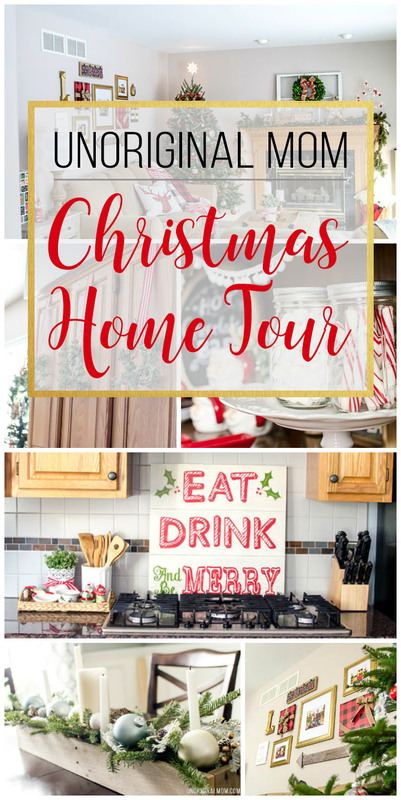 I’m so glad you stopped by to take a peek at our house all decked out for Christmas. I can’t wait to show you around! Ok, without further ado, let’s step inside! As you come in the door to our house, we have a nice big two story foyer. To your right is the dining room, and to the left is the piano room. 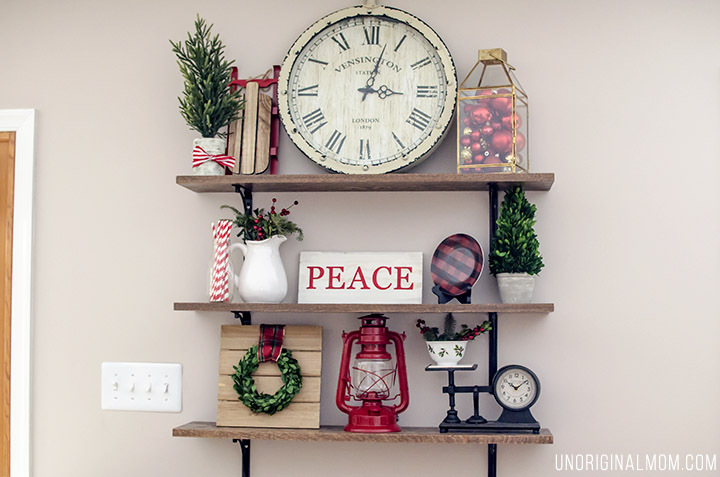 These are all spaces that are usually behind baby gates, so I’m able to do a bit “fancier” decorating with breakable things that need to stay away from little hands. 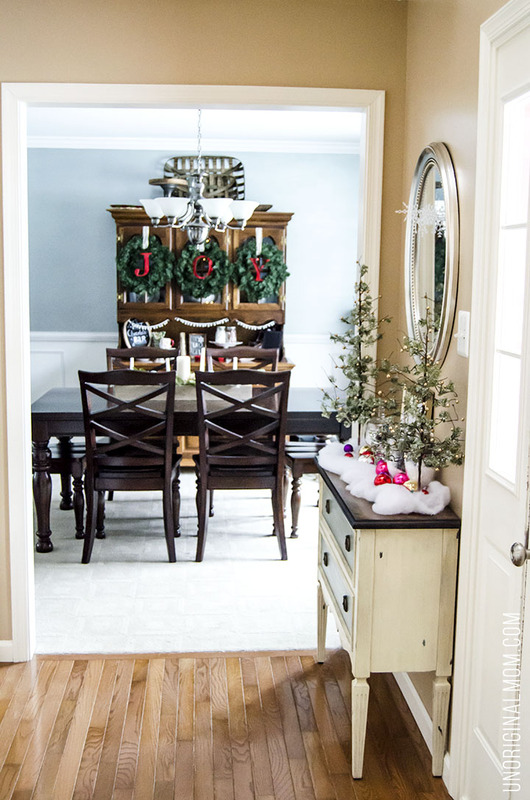 Here’s our little foyer nook that is relatively new…it just came together a few months ago. 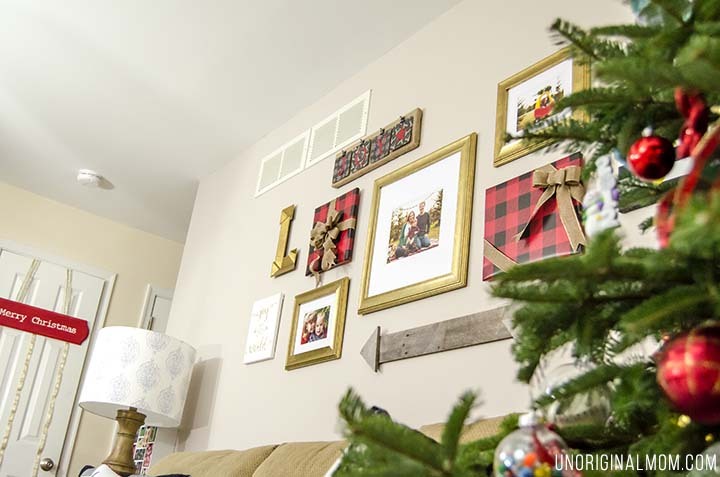 The framed canvas art as well as the bench are both DIY projects. 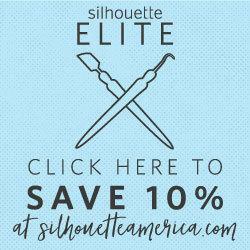 (See how it looked decorated for fall in this post!) 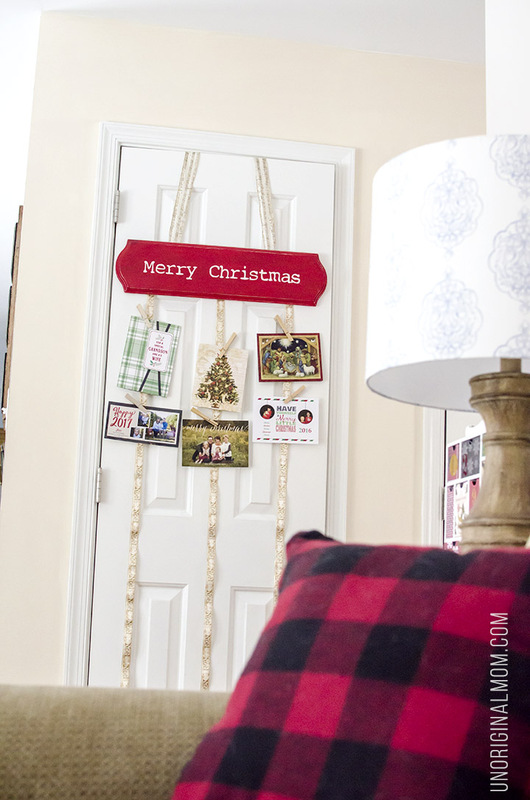 I added a felt pom pom garland from this Etsy shop and I just LOVE how fun it is! 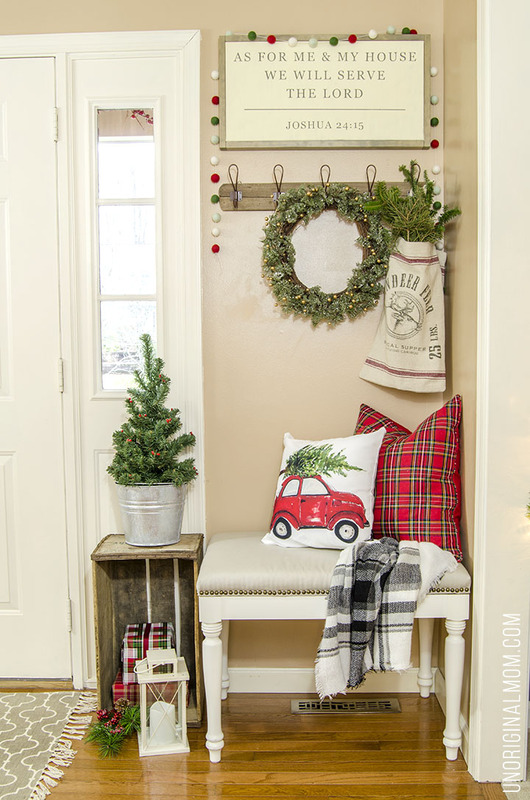 The wreath and reindeer feed bag are from Decor Steals, and the pillow cover is a super popular one from Craftberry Bush that you’ll see all over Pinterest. 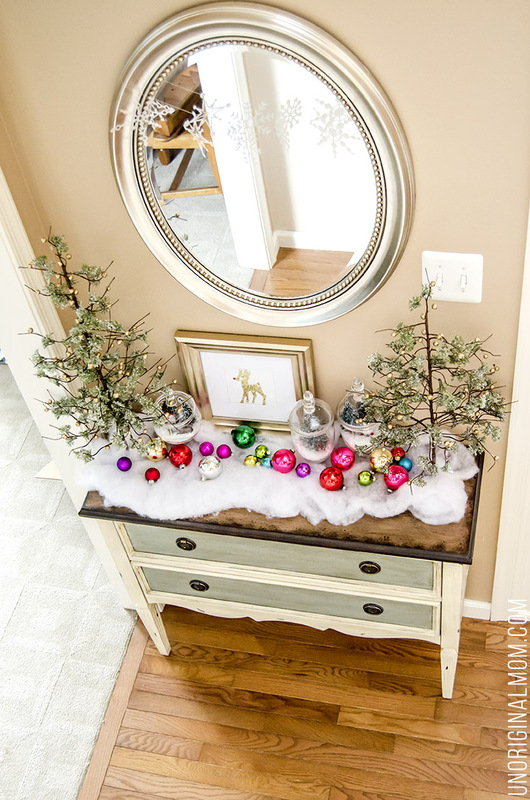 On the other side of the front door is a little console table that is perfect for decorating with seasonal vignettes. It has actually evolved quite a bit over the past month – it took me a while to get it right. 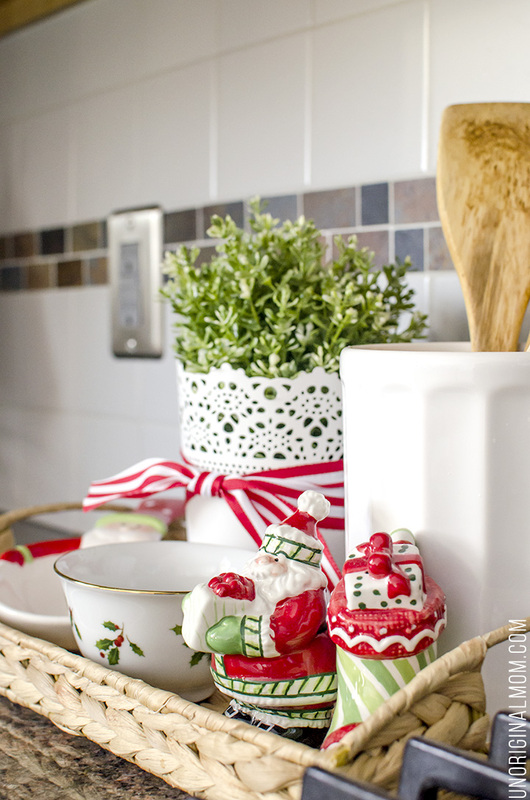 I started with a long narrow dough bowl full of those ornaments (super cheap finds at Goodwill! 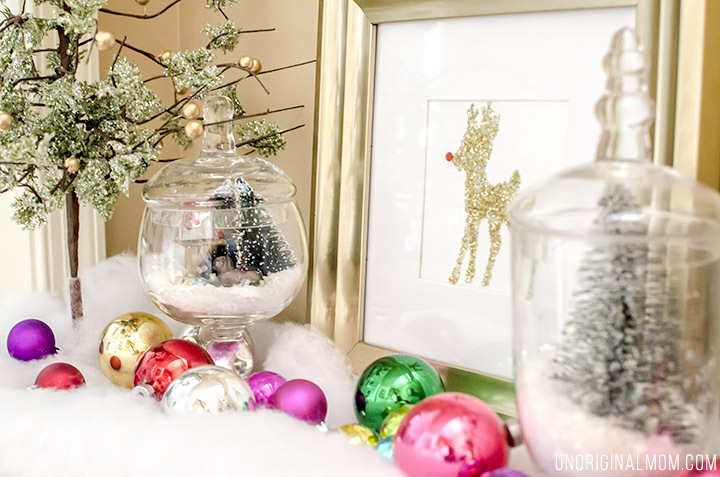 ), but I wanted to incorporate my apothecary jar snow globes and my glitter Rudolph print and the table just wasn’t deep enough to fit it all. So I got rid of the dough bowl, added some buffalo snow and scattered the ornaments instead. 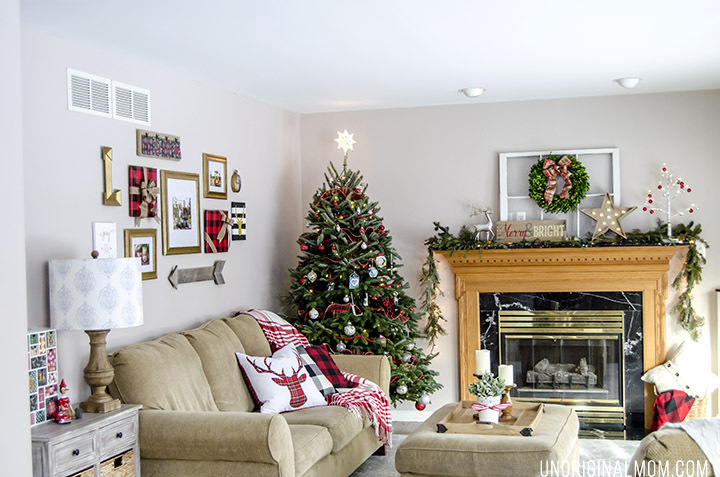 I had ordered the trees from Decor Steals a few weeks ago and completely forgot about them until they arrived…they didn’t have to travel far from the front door, as this was the perfect spot for them! Finally, the mirror needed a little dressing up so I cut some simple paper snowflakes out of vellum using my Silhouette. I love how fun and whimsical this space turned out. 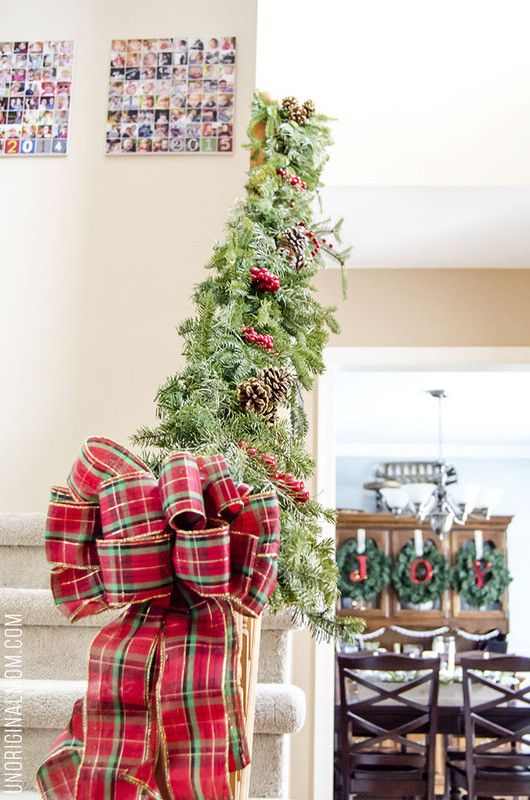 This is our third Christmas in this house, and every year I add a garland on our stairs. It’s so pretty, plus it makes the foyer smell amazing! 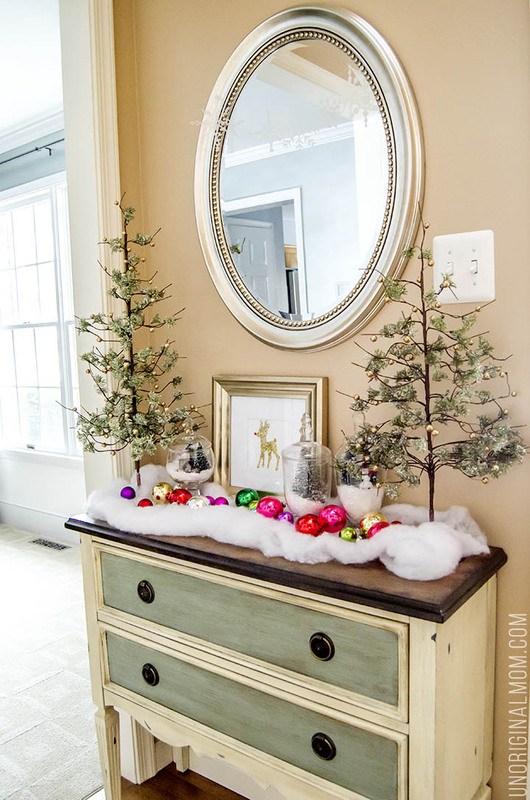 I make it out of a cheap-o fake garland from Walmart and free clippings from the Christmas tree farm – see the full how-to here. That’s it for the foyer! Make a right and you’ll step into our formal dining room. I’ll be honest, we don’t use this space as much as I’d like and it often becomes a dumping ground for all kinds of odds and ends. 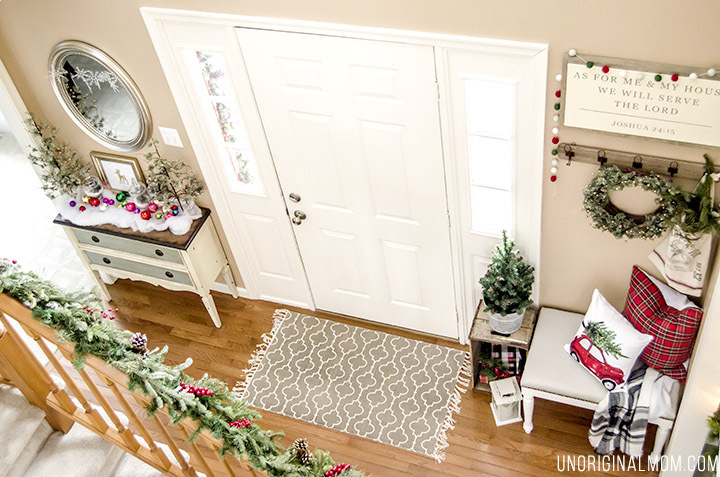 It took me a while, but I finally cleared it (mostly) of clutter and dressed it up for the season. 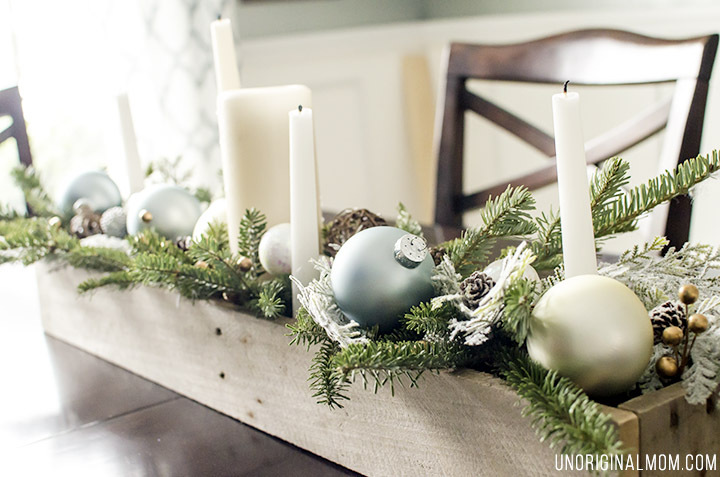 Here’s a peek at how my pallet box centerpiece is looking for Christmas. I love filling it up for each season! 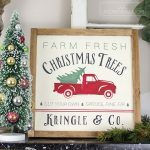 See the fall version with chalk paint pumpkins here, and the spring version with aqua mason jars and tulips here. 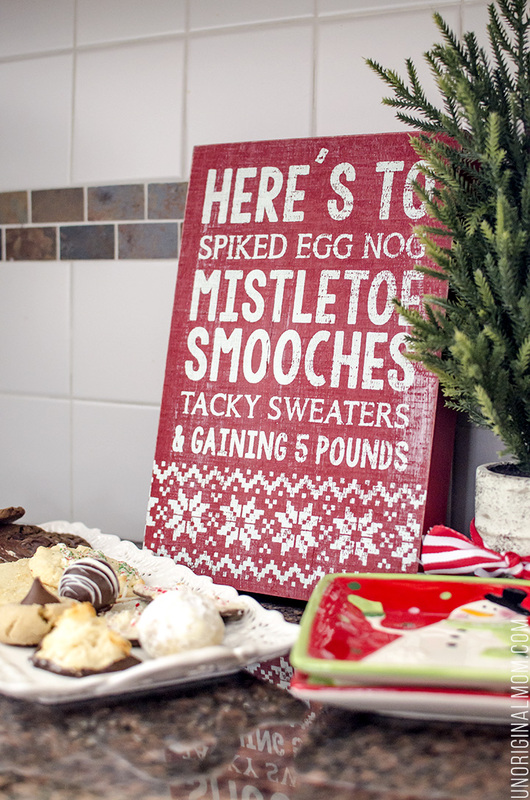 I thought the hot chocolate bar would be mostly for decor, but we’ve already used it! 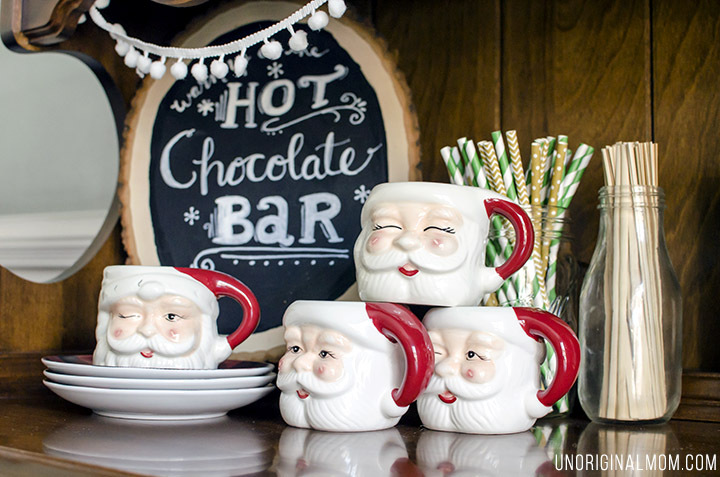 And I just can’t get enough of those adorable vintage Santa mugs, hehe. Head from the dining room towards the back of our house and you’ll find the kitchen. 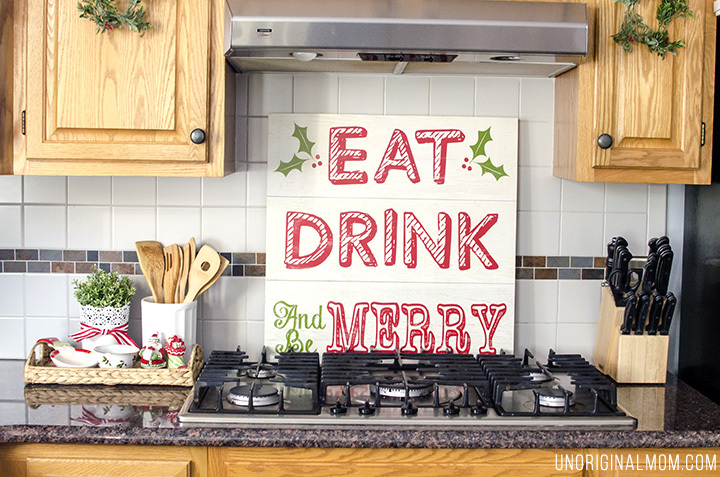 This is the first time I’ve ever done any Christmas decorating in the kitchen, and I absolutely love it! I was actually searching for a wreath to go above the stove until I came across this sign at TJ Maxx. Isn’t it perfect for the kitchen? Believe it or not, I had wrapped up these cute salt and pepper shakers to give away at a white elephant gift exchange last year. We ended up not going at the last minute, so I stuck them back in a Christmas bin. Boy, am I glad I held onto them! 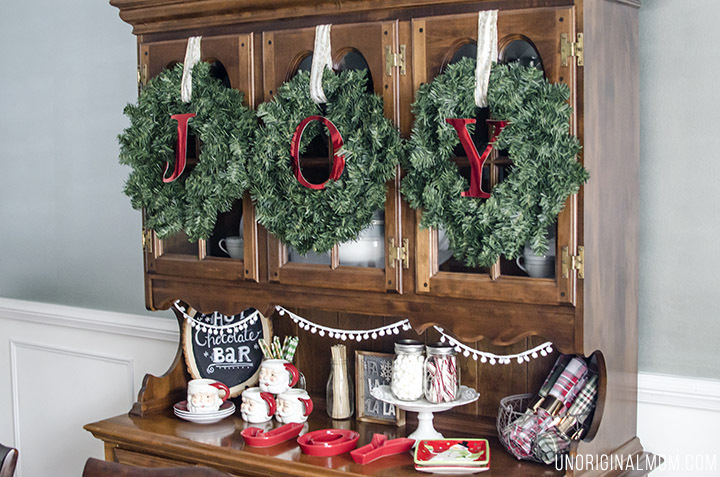 These mini “wreaths” are just circles of garland I picked up at Michael’s on sale with a coupon. I’d been keeping an eye out for small boxwood wreaths but they’re just so gosh darn expensive! 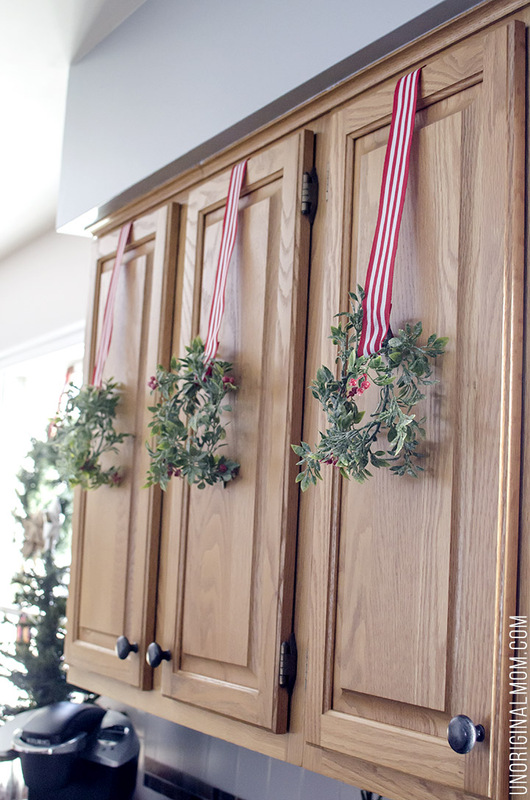 This way was a lot more cost effective…I did seven cabinets for about $15, including the ribbon. 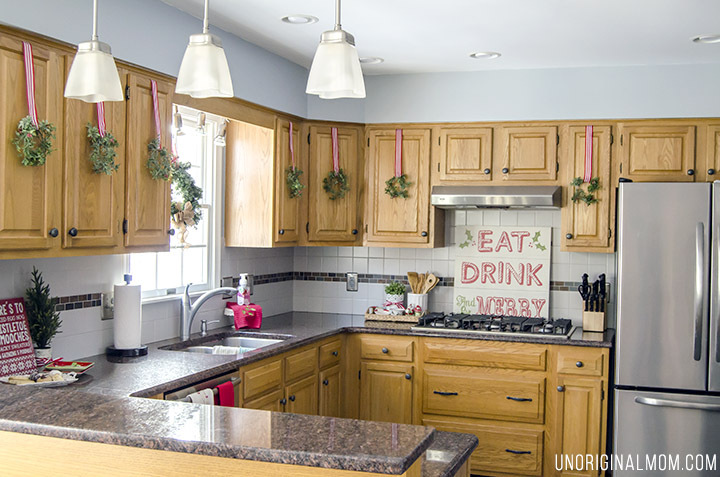 The kitchen opens up into our family, which is where we spend most of our time. I have big plans for redoing that mantel and fireplace surround…someday. The gallery wall got all dressed up for Christmas, too! You can see more details about it here. We are a cut-your-own Christmas tree family, but decided to go a little smaller this year so we could tuck it back in the corner. I think it looks lovely, and is a whole lot more practical than the big ones we’ve gotten in the past (which mean rearranging the entire living room). And finally, on the wall opposite our sofa, are these beautiful farmhouse shelves that my husband made for me! Aren’t they amazing? 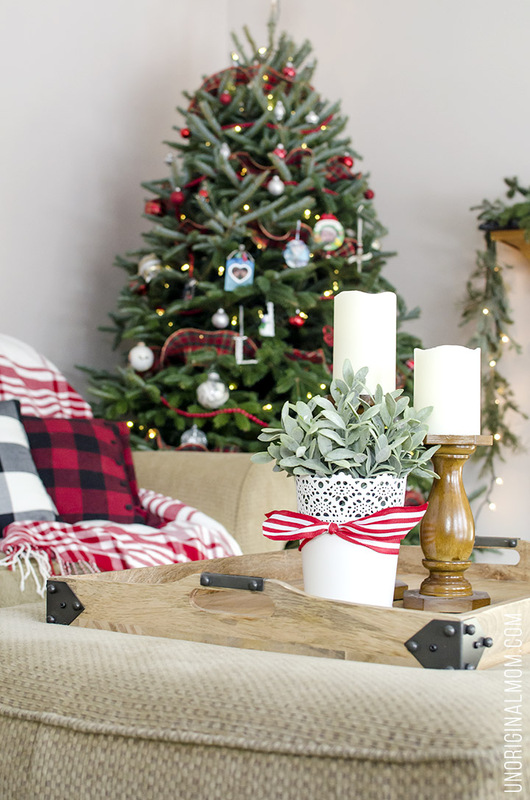 I’m hoping to devote a full blog post to them next month, but I still had to show you how I styled them for Christmas. 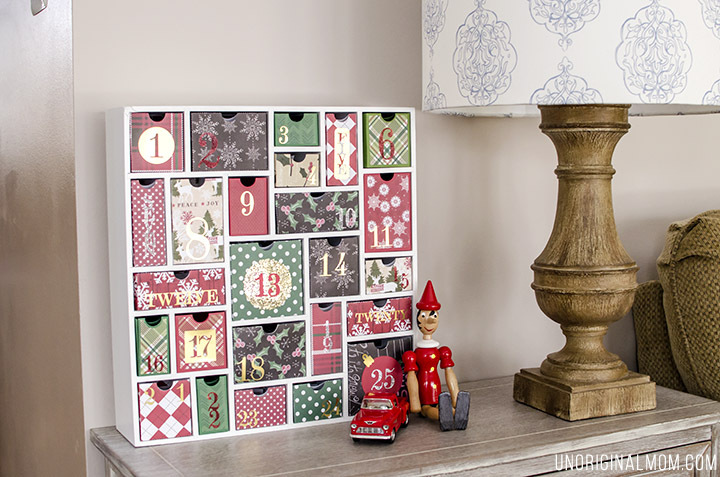 I love having some extra flat surfaces to decorate! Well, that’s it for the home tour – thanks for visiting! I hope you enjoyed a peek into our home. Come back soon! And Merry Christmas! 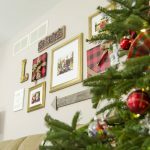 ← DIY Flannel Foot Warmer with Free Cut File – plus a GIVEAWAY! I love your home! 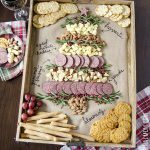 All the little details make it look so festive for Christmas. 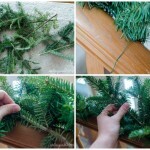 Also, great idea mixing fake garland with real clippings. I bet it does smell amazing! I’m so glad you shared your home with us. ? Thank you and have amazing holidays!